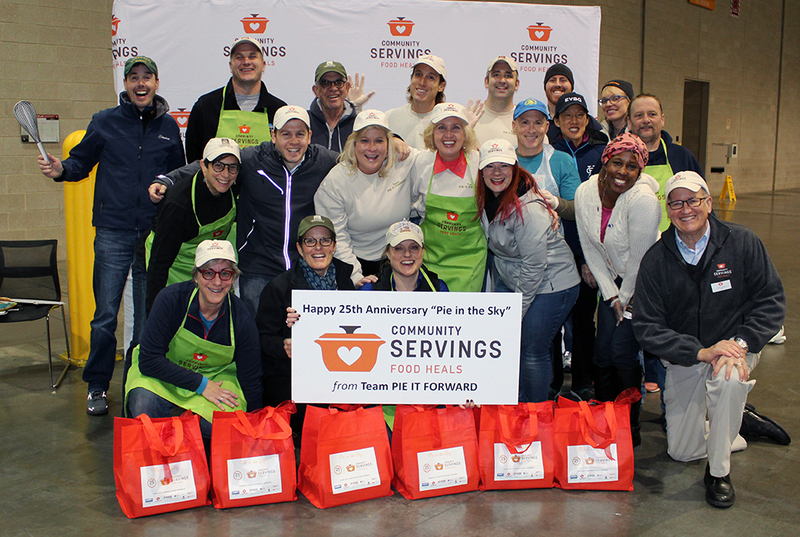 This year marked the 25th anniversary of Community Servings’ Pie in the Sky Thanksgiving bake sale, the “World’s Greatest Bake Sale”, bringing together more than 150 most generous Boston-area chefs, bakers, and caterers to bake and donate 22,000 pies, raising $800,000 and counting. The funds support Community Servings’ mission to provide made-from-scratch, medically tailored meals to the critically ill throughout the Commonwealth. More than 650 volunteers participated in distributing, packaging, and selling pies at 100 pick-up locations this year. Each pie sold for 30 dollars will allow Community Servings to provide one week’s worth of made-from-scratch meals to one of their critically ill clients and families, spreading the idea that food is medicine. The Pie in the Sky success is due directly to title sponsors Coldwell Banker Residential Brokerage and Digitas, and the loyal bakers who have returned each year for the past 25 years, including, The Catered Affair; Cuisine Chez Vous; Davio’s Northern Italian Steakhouse; Four Seasons Boston; Gourmet Caterers; Grill 23 & Bar; and Harvest. The bakers with most pies baked included Montilio’s Baking Company, Community Servings, Boston Baking Company, Dunkin’ Brands Inc., Basil Tree Catering, and Flour Bakery and Cafe. The spine and backbone of the sale truly lies not only with the bakers, but also with the sellers. This year the top seller sold more than 2,900 pies. The top pie selling team raised $90,000 for Community Servings. 75 sellers sold more than 50 pies. Pie in the Sky in the News! BostonChefs.com: It’s Pie in the Sky Time!